United Income is hoping a move toward “radical transparency” in client reporting. The kind that it’s releasing in its new performance reporting tool—will catch on and spread throughout wealth management—and if it doesn’t, the firm is counting on regulators to compel holdouts to change their ways. The automated investment platform built for those nearing retirement, founded by Morningstar’s former chief innovation officer Matt Fellowes, is calling on the industry to report a “total wealth return” for each client in lieu of simply reporting investment returns. 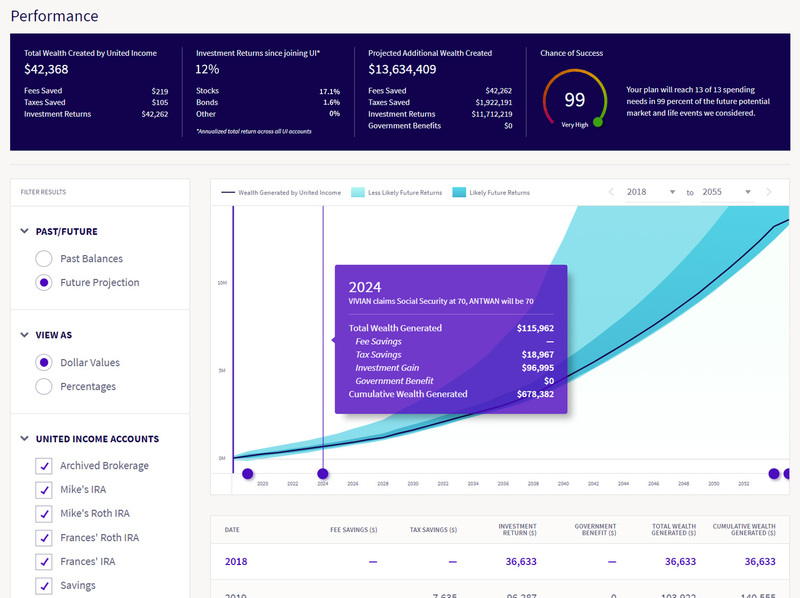 It’s a step they’re implementing in a new upgrade to the platform which will report clients’ returns net of investment fees, tax considerations and other factors, giving end clients a better picture of their financial health over time. The new reporting tool runs a number of comparisons to provide its total wealth return. It compares the fees charged by an end client’s advisor immediately before transferring funds to United Income, and displaying the fees saved, if applicable, with the automated platform. It calculates future projected taxes saved by running the firm’s tax optimization drawdown advice against the standard advice of first drawing down taxable accounts followed by tax-deferred accounts. The tool also looks at the optimal Social Security claim age, providing guidance in real dollars and cents against common financial behavior. Fellowes argued that United Income does provide the financial personalization that Welsh described, perhaps even beyond what advisors do. The algorithms take in end clients’ risk tolerances and behaviors, including lifestyle factors like smoking and exercise habits. It pulls in personalized actuarial data and spending calculations, and utilizes data feeds funded by the U.S. government. He is quick to point out the policy wonks on the company’s board, including Dr. Erica Groshen, a former commissioner of the U.S. Bureau of Labor Statistics. All of the data goes to provide a maximized plan for clients that will be captured in their performance metrics, against a straightforward investment return calculation.